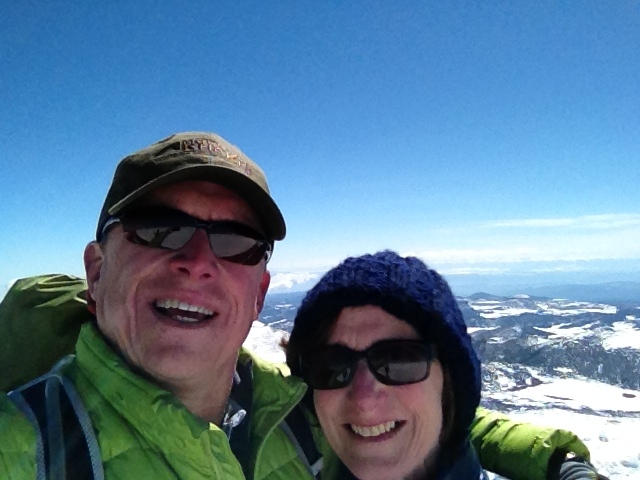 The family that explores together … Chuck Millsaps and wife Kim atop Colorado’s Pikes Peak. Our ongoing profiles of the folks who are the backbone of Great Outdoor Provision Co. continues today with a chat with what most companies call their president, what we refer to as our Minister of Culture, Chuck Millsaps, who is also part of the owner management team at Great Outdoor Provision Co. 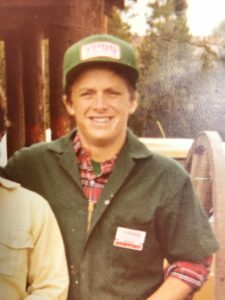 In his 31 years with Great Outdoor Provision Co., Chuck Millsaps has gone from sales associate to Minister of Culture. Minister of Culture? you ask. How does one become a Minister of Culture? And what does that mean? Chuck answers those questions and more. Q. How did you get interested in the outdoors? Pumping gas to fuel a blossoming outdoors habit. My older sister was in the Girl Scouts when we were growing up in Charlotte and my mom was very active with her troop. I used to tag along on their outings. But my love of the outdoors really expanded once my sister began working in Yellowstone National Park in the 1970s. When I was 14, my parents decided it would be good for me to go out and stay with her a couple months. I wasn’t a troubled kid, at least I don’t think I was. But they thought it would be good for me. And boy was it ever! I ended up spending four summers in Yellowstone. I supported my backpacking and climbing habit by pumping gas in the Park. Q. What did you learn from your Yellowstone summers? Well, for starters I learned first-hand about the gift of our National Park Service. Wandering across those lands produced an immense sense of gratitude for the leaders and volunteers who made it their mission to protect open space. While pumping gas (no self-serve back then) I met thousands of people from around the world who came to experience America’s greatest idea. That mission remains a key part of what we do here at Great Outdoor Provision Co. – helping folks discover wild places. I also learned how to survive, despite myself. I got into climbing and one weekend convinced some buddies that we should climb the Grand Teton. We got a late start on the mountain and by the time we reached the summit it was nearly dark. We intended to descend via the Owen-Spalding route but could not find “official rappel” anchor. Finally, we saw an anchor and I thought, “Well this must be it.” It was completely dark by then. We repelled down, but had to spend the night on a ledge. The next morning we were walking out and we kept passing climbers who were headed up, who gave us these looks like, “Man, they must be good! They’re already coming back down!” Little did they know … . 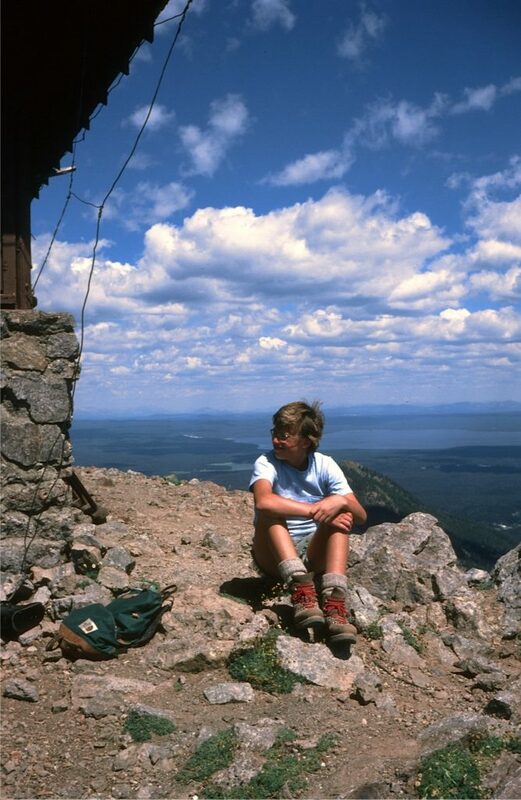 An early summit, atop Mount Sheridan in Yellowstone National Park. Q. When did you start at Great Outdoor Provision Co.? Q. Tell us about your journey at Great Outdoor Provision Co.
Each day is still an adventure. My colleagues here at GOPC and the customers make the time most rewarding. I refer to my experience as a “turtle on a fence-post”: somebody just put me here. I had the good fortune to start out on the sales floor in Charlotte where I had grown up. Bill was and continues to be a great mentor as we work to deliver great service to our customers. Moving to Raleigh in 1988 allowed more time with our founder, Tom Valone, who personifies the spirit of the company. Tom is still around to provide guidance during the ownership transition as we strive to build on his foundation of a sustainable business that gives back to the community. Q. You helped launch a clothing line in 1994 called “Layers.” Tell us about that. Patagonia had just reformulated their Capilene base-layer. The new fabrication provided an opportunity to introduce a complimentary thermal layer that we could market alongside of Patagonia’s new Capliene. We began producing finished garments right here in the Triangle and shipping to other outdoor specialty shops around the U.S. The experience provided tremendous insight into the manufacturing process and gave us a window into the world of our suppliers. We still see customers wearing Layers products and enjoy hearing their stories of where and when they first made the purchase. Q. You’re the company president, but you stick with the title “Minister of Culture.” How would you describe what you do at Great Outdoor? Tom gave me that title over 10 years ago. I don’t wear a collar. Marketing is an ordinary function of any business but our approach to advertising is anything but typical. We are strong believers that “people make the place,” so we commit our resources to celebrate the in-store experience with our staff and the outdoor experience we find in wild places. This perspective allows us to make significant financial investments in land conservation to protect the areas that our customers hold dear and that we hope to share with our grandchildren. My role is to work alongside our staff to inspire others to get outside and embark on their own stewardship for wild places. Q. What’s the biggest challenge you face as a locally owned and independent retailer in a landscape dominated by big box stores and online sales? Our role as a specialty retailer is the creative problem solver. The current landscape offers a glut of “solutions,” but how does one choose? A recent study indicates that more than 150 billion new clothing items are produced each year, much of which winds up in a landfill. This predicament creates an opportunity for GOPC to highlight our mindful approach to curating an exclusive selection of items that perform to the high standards of our customers. Our customers appreciate our professional staff, who help navigate the pathway to finding clothing and gear that enables them to play outside for years. Q. What’s the big advantage Great Outdoor Provision Co. offers over its competitors? Our staff. We’re so fortunate to have a team of shop managers who have been with us 20+ years. Their leadership attracts a crew of diverse outdoor enthusiasts that truly love to help others on the sales floor. Our product category managers are also very special. They work tirelessly to discover, sample and crash-dummy test the gear before it goes on the sales floor. Bittu, our paddlesports guru, has boated world-class whitewater. Scott, who sources our fly-fishing product has fished a storybook of rivers and streams; his accomplishments have been published. Rich, who selects our climbing and backpacking gear, has climbed all over the world. Amy, our sportswear buyer and NCSU textiles grad, has developed her own signature line of clothing. Many of our retail staff have thru-hiked the AT or other far-flung trails. Together it creates a fun environment that blurs the lines between work and play. We hope our customers experience this personality when they step onto our creaky wooden floors. Q. What are some of the big changes you’ve witnessed during your 31 years here? Well of course technology. Everything is so much lighter. We recently had a customer bring in his Galibier Super Guides that he bought from us in the ‘70’s. At the time the GSG were the pinnacle in mountaineering boots. Some folks still make that claim. The sales staff, not even born when these boots were made, stood astounded at their design and the weight of the full leather boot. The boots on our footwear wall today weigh but a fraction of that vintage Galibier. This evolution of lightweight gear combined with “60 is the new 40” has more people getting outside. I am inspired by the diversity of people who are discovering how the outdoors improves their ability to relax, gain perspective and experience more enjoyment in life. The more we go Jetsons, the more we become Flintstones. The escalation in technology requires that we also find time outside and unplugged. Q. When you aren’t ministering the culture of Great Outdoor Provision, what do you like to do? Trail running continues to be my go-to adventure. I run at Umstead State Park several times a week. What a jewel of a Park right here in our bustling city! The Umstead trail marathon each March is a favorite. The mountains provide an escape where I enjoy hiking & fly fishing. The Wilson’s Creek area is among my favorite. Paddling in the Upper Peninsula of Michigan with my wife and family is an annual trip. And I love working on the retail sales floor here at Cameron Village, where I always learn something new from our staff and our great customers who keep us in business.